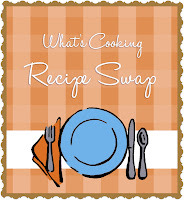 It's Blogger's Choice time again - my favorite Recipe Swap hosted by A Taste of Home Cooking. I was given a blog that I'm very familiar with, I Was Born to Cook, so I knew I'd have a hard time deciding. Melissa, the blog's author, has a ton of great recipes, from apps, pasta, and main dishes to a huge index of sweets. Once again, I chose to bake something for the Swap. My friend's birthday was last weekend, and I was going to be cooking dinner for her, so I thought baking a cake would be a nice surprise, especially since my friend is always the one doing the baking! Unfortunately we had to change her plans and we couldn't get together, but I still made the cake in her honor. I looked through the list of sweets on Melissa's blog, and what a list it is! It was so hard to choose, but then I saw a cake that I had never heard of - a Philly Fluff Cake. It looked delicious, sounded like something I could handle, and I already had most of the ingredients on hand. 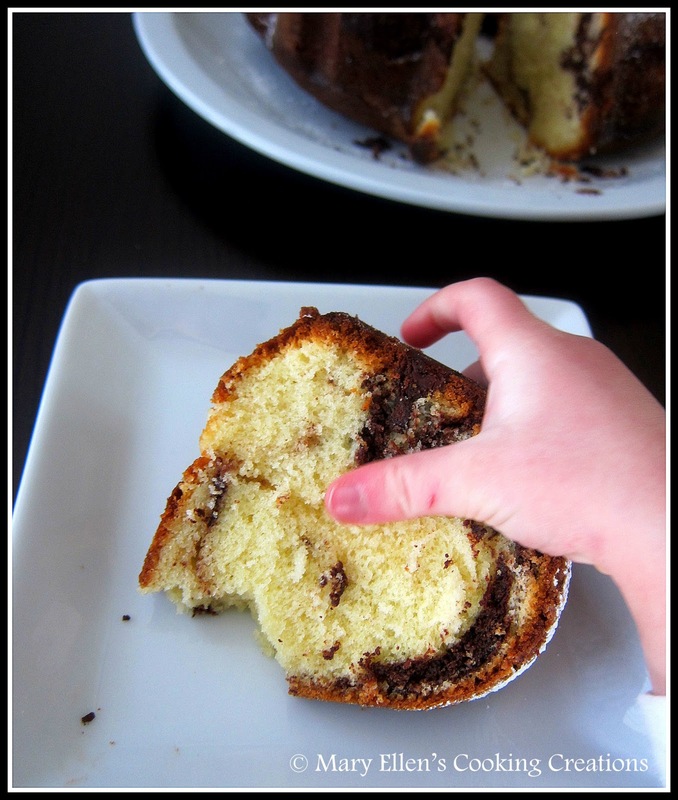 My favorite thing about this cake was the layer of swirled chocolate. It looked so pretty when I cut into the cake, and it added another level of sweetness to an already delicious cake. One note on the recipe and a little mistake I made - I bought a block of cream cheese, but when I started to get my ingredients together I realized the recipe called for 10 oz of cream cheese, and a block is only 8 oz. I went ahead with it anyway, and the cake was still incredibly moist and delicious. I can only imagine that it would just be better with the correct amount of cream cheese. Jon, our daughter, my parents, and a few people at work ate this cake and loved it! (Jenny, I'm sorry you missed it but I will make it for you another time!!) 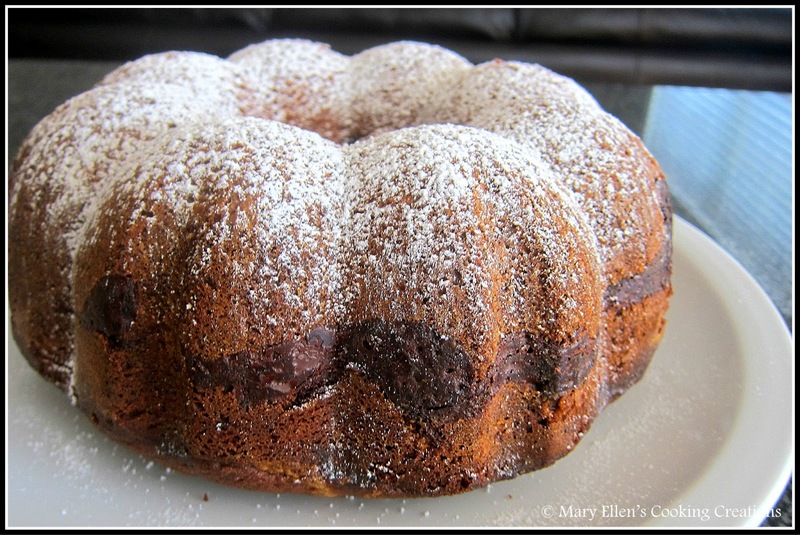 I'm so happy that I was able to bake a delicious cake from scratch, and that I now have a cake that I can make for parties and holidays (I know, I know, it's not that hard, but baking hasn't been my thing!). My recent successes are even making me think about investing in a Kitchen Aid Mixer! Just one more picture before I share the recipe. I was taking pictures when all of the sudden I saw a little hand reaching for the slice of cake. I caught her!!! Beat cream cheese, butter and shortening together until light and fluffy. Add flour, baking powder and salt. Beat on low until combined. Batter will be thick. Gradually add 1 cup sugar and eggs, one at a time, beating completely between each one. Add vanilla and remaining sugar. 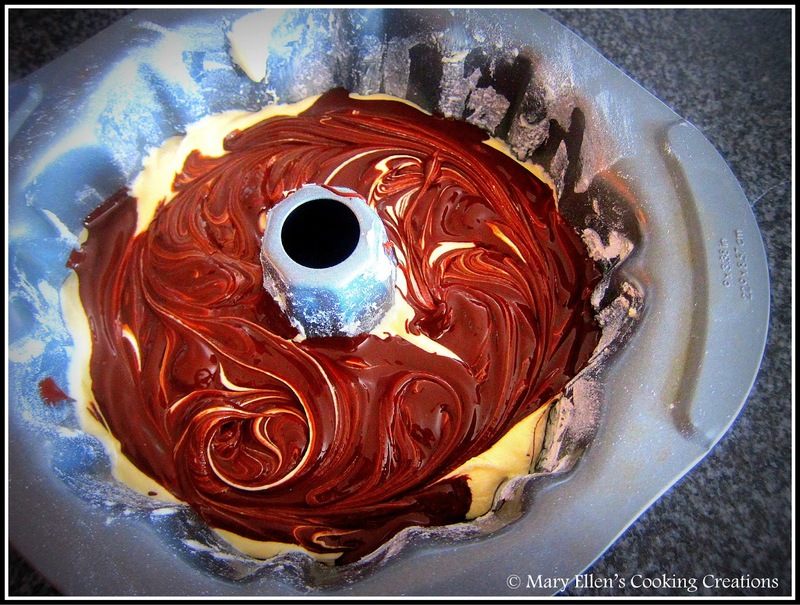 Continue beating until batter is smooth, scraping sides of bowl a few times. Add chocolate and swirl the batter with a knife to spread chocolate through. 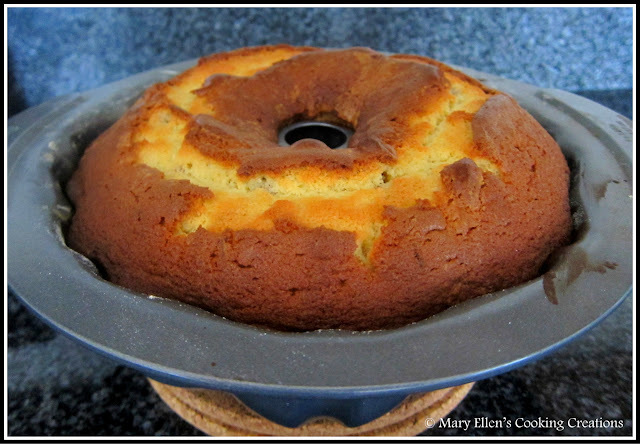 Top with remaining batter and bake for about 60-65 minutes, or until a toothpick comes out of center clean. Great choice! Glad it turned out well with the lower amount of cream cheese. 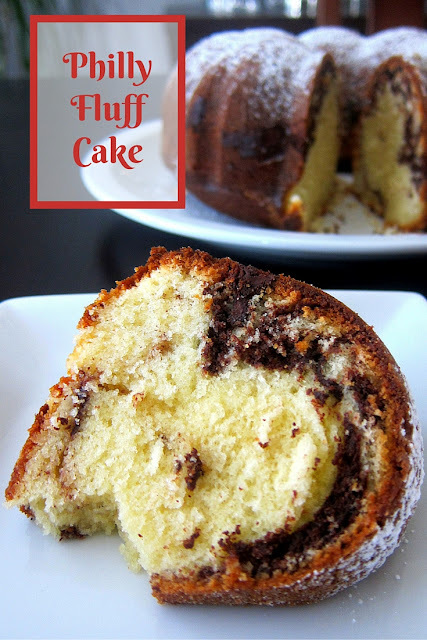 This looks like an easy and delicious cake! It looks like these swaps are making you more comfortable with baking! Your cake is beautiful! 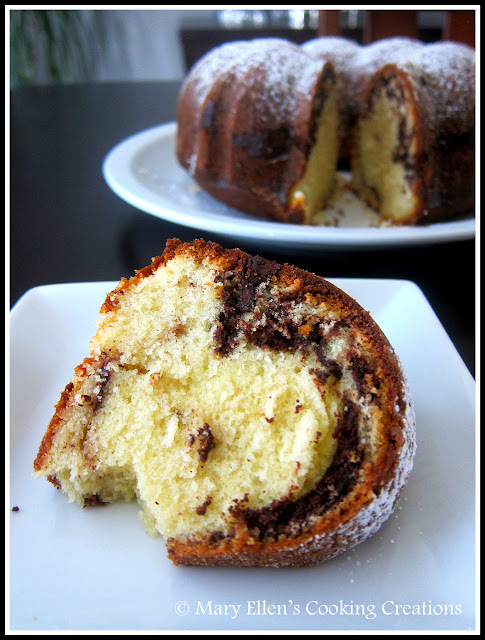 It looks delicious, but how could a cake with cream cheese be bad? Yum! This looks incredible! I don't need to be baking right now but I'm going to have a hard time resisting.